How To Fix a Landscape Drainage Problem On Your Property. Many commercial and residential properties experience some type of drainage problem. You know you have a drainage issue if, after a rainfall, your lawn looks like a pond, it takes ages for water to disappear, and you are left with a soggy, muddy mess. Cleaning up your property after it's been flooded from a drainage problem can easily result in $10,000 to $20,000 down the drain. So before the next rainfall occurs, call a landscaping professional to help you address drainage issues. Being proactive when it comes to property drainage is very important. Causes root rot. With water seeping below ground and sitting there for days, the roots of grass, trees and shrubs can begin to rot and need to be replaced. With time, the combination of sitting water and root rot creates the perfect breeding ground for harmful mold or mildew. Soil compaction. Any weight applied to the soil when wet causes the soil to compress and become denser. With commercial properties that experience heavy foot traffic, this problem is compounded. Soil compaction reduces the permeability and drainage creating a vicious cycle that leads to more drainage issues down the road. Building damage. If the grading of your landscaping slopes towards your building rather than away from it, or if too much water is sitting too close to the building, water can leak in through cracks. Leaking water can cause massive damage to the basement or crawl space, and in more severe scenarios, create a foundation leak. Attracts mosquitoes. Any sitting bodies of water create a fertile breeding ground for pesky mosquitoes. Now that you know about the potential damage that drainage issues can inflict, where do you begin? A professional landscaping company can visit your property and conduct an onsite audit. Inspect the property and examine where water sits on the grounds and the direction it travels. Look at existing topography, types of plants and trees around the yard, determine the direction the property is facing and size of yard, etc. Come up with a plan of action to mitigate drainage issues. Bioswales. This involves creating a shallow depression in the landscaping with the purpose of naturally filtering out harmful pollutants, chemicals, and silt that is often contained in water runoff. These pollutants and chemicals come from fertilizers, herbicides, and pesticides used in lawn care. Rain garden. The purpose of a rain garden is to introduce a highly absorbent area which acts like a sponge with water-friendly plants that can absorb and withstand moisture and a high concentration of nutrients. Adding organic matter. To address soil compaction, introducing organic matter such as grass, compost by-products, and wood chips helps improve drainage and breaks up clay that develops in moist soils. Fix grading/topography. A professional landscaping company can address any recesses which lead water towards your building and introduce slopes to divert the water away. Introduce water-friendly plants. The types of plants you have on your property can affect water absorption. Introducing more low-growing plants that are highly absorbent and thrive in wet soils can improve drainage. Create a drain. For more severe drainage issues, a landscaper can create a water drain. This is a large undertaking which may involve digging up some plants along the way. Does Your Property Need a Redesign? 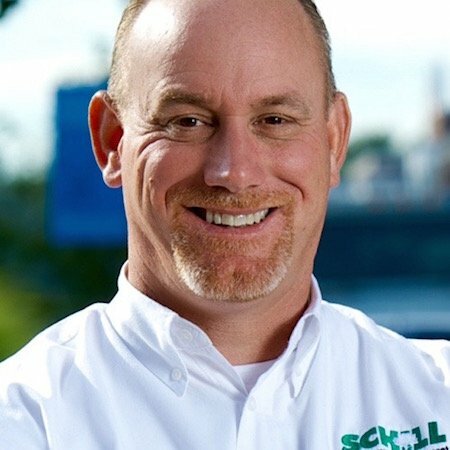 Schill Grounds Management has a team of experienced landscape professsionals that create sustainable landscapes designed to improve water conservation and are lower-maintenance. We also use bio-nutritional fertilizers which are based in organic products and contain only a small dose of synthetic chemicals to help keep your lawn lush and weed-free. Addressing drainage issues in a timely manner and working with an experienced landscaping partner helps to prevent costly damage to your landscaping and building. Contact Schill Grounds Management immediately to schedule a free onsite inspection of your property.